Having spent many years trying unsuccessfully to write the longest works possible (novels) Ed Bremson at the age of sixty discovered, and began writing, the shortest works possible (haiku.) In 2009 he earned an MFA in Creative Writing - Poetry. Then in 2011 he joined social media. Joining Twitter is one of the best things I ever did,  he says. The brief format of the posts there is ideal for writing haiku, and there are a lot of haiku written on Twitter. Later that same year he joined Facebook. 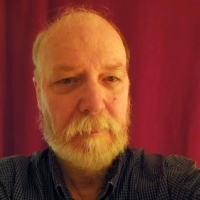 He has had many individual poems published, including several with the Japanese newspapers The Asahi Shimbun and The Mainichi Daily; in online journals: Under the Basho, The Bamboo Hut, Failed Haiku, Prune Juice, Autumn Moon Haiku Journal, Contemporary Haibun Online and other. Also, he has won several awards for his writing, and was chosen three times as Haiku Master of the Week on NHK World  - Haiku Masters TV program, Japan. A widower, Ed is retired, and he lives in Raleigh, North Carolina, USA. Awards and Other Honors: Winner Haiku Pen Contest, 2012; Winner 7th International (White) Kukai, October 2012; Honorable mention Mainichi Haiku Contest, 2012; Third place International (Butterfly) Kukai, March 2013; Honorable mention Vladimir Devidé Haiku contest, 2013; Third prize winner 21st Kusamakura Haiku Contest, 2016; Honorable mention Australian Haiku Society Autumn 2017 Haiga Kukai: Non Seasonal. Books Published: With Dreams of Summer Stars, Writers & Lovers Studio, 2014; The Nature of Feeling - haiku from Mongolia, ed. Ed Bremson, 2014 ; Like a Summer Night, Finishing Line Press, 2015; Flowers Speaking to Hearts, Santiam River Publishing, 2017.